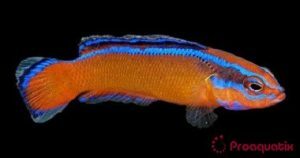 An orange-colored Dottyback with a blue stripe that runs along the dorsal body, fins, and dorsal caudal fin. Two additional short blue stripes appear on the head. Pseudochromis aldabraensis is a carnivore of worms and other small invertebrates. This species is highly territorial towards conspecifics. Eastern coast of Africa, southwards to South Africa. Behavior:Often seen near an area where a quick retreat into rocks is possible.